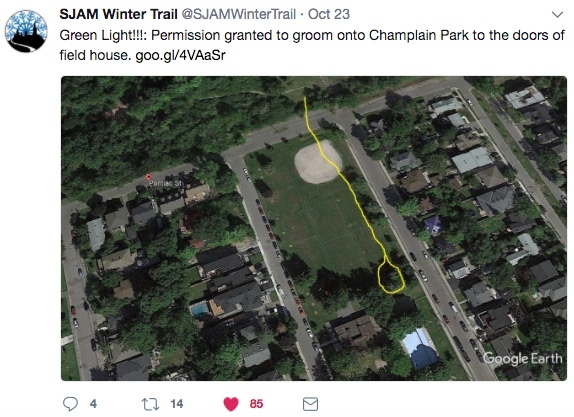 We had a great meeting this week with representatives from the National Capital Commission, City of Ottawa, Dovercourt Recreation Association, Champlain Park Community Association, and my office to hammer out some details about bringing the popular SJAM Winter Trail to the doorstep of the Champlain Park Field House. It means skiers, walkers, snowshoers and fat-bikers will be able to use the washrooms and change facilities during the hours when the park rink is in operation - generally weeknights and weekend afternoons. It's great news. Dave Adams, who for the most part grooms the trail, has been able to thread the needle on a path that won't interfere with the rink, working with the community association and rink operator. The grooming is possible since the portion of Pontiac between Cowley and Carleton was recently (finally) closed to car traffic a couple of months ago - something that I was very pleased to be able to accomplish.